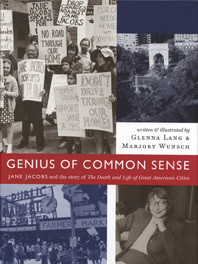 David R. Godine recently published Genius of Common Sense: The Story of Jane Jacobs and The Death and Life of Great American Cities, the first book to introduce young people to the influential author and activist Jane Jacobs. Her now-classic 1961 book convinced people to value their cities, called for an end to the wrecking ball of “urban renewal,” and ultimately changed the world. In words and pictures, Genius of Common Sense follows the obstreperous young Jane from her childhood in Scranton, Pennsylvania, through her groundbreaking work, The Death and Life of Great American Cities, and her involvement in battles to save the very neighborhoods she wrote about. Jane Jacobs’s lifelong principle of trusting her own observations more than conventional wisdom will inspire young readers to contemplate their surroundings, think for themselves, and participate in their communities. Readers of all ages will learn something new and enjoy this tale, abundantly illustrated with the authors’ drawings and photographs as well as many vintage photographs never before published. To honor the life and work of Jane Jacobs, on the first weekend in May, people across America and around the world organize and participate in free neighborhood walking tours that allow citizens to rediscover their city and one another. To learn about this growing tradition or to find a walk near you, visit Jane's Walk USA. You can read this author's account of one such Jane's Walk here. click on thumbnail sketches to the left.